Some consumers are wary about letting their garments go through cycles of two different machines, the washer and the dryer, but with the LG DLEX3360V there is no need to fret. The Ultra-Capacity dryer from a reputable appliances brand delivers 12 drying programs, one of which is the trademark EasyIron. This program helps make ironing easier by giving the garments some moisture the iron can used to glide. For consumers who do not want to have to put in much effort in their ironing, the LG DLEX3360V is a good deal as it provides 12 drying programs including one that provides just enough moisture on the garments to get the iron gliding on them. The SteamFresh and TrueSteam technologies, which are innovations of LGís Ultra-Capacity series of dryers, also make ironing much easier. The convenient 20 minute drying system provided by the LG DLEX3360V is a must for large households or for extra-busy consumers. Another convenient feature is the Wrinkle Care cycle. This cycle, as the name suggests, reduces wrinkles and also reduces ironing time. The drying cycle may be finished by 20 minutes but it is not pegged at that duration. The Sensor Dry feature enables the dryer to detect the amount of moisture found on the garments. The length of time of the drying cycle will depend on that amount of moisture to ensure that each piece of garment from each load will be dry after the cycle. While the LG DLEX3360V can efficiently dry heavy loads in a short period of time, the appliance does not do this complete with noise and vibration that can disturb a household. The dryer comes with the trademark LG LoDecibel motor that enables it to perform powerfully sans the noise and vibration. At 7.4 cubic feet, the LG DLEX3360V has enough space for the heaviest loads. Each full load can average its drying time at 20 minutes. So, even the biggest households can finish their loads in a small fraction of the usual time. The LG DLEX3360V has a stylish exterior. 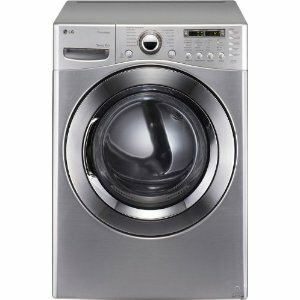 The dryer is made of graphite steel and has a large door with glass and a chrome rim. The control panel makes use of dual LED display. The dryer is made of sturdy materials, such as plastic, stainless steel and glass. The LG DLEX3360V has been designed to last. The LG DLEX3360V is designed to make ironing so much easier. The drying process itself is faster. So, even the busiest consumers will appreciate this appliance. With its big capacity, the dryer can take on laundry from even the biggest households. The cycles do not take long, either. The whole package looks great, sophisticated and modern. This dryer is not Energy Star compliant. The Delay Start function is not included.